The life of a startup entrepreneurship is anything but easy. Anywhere in the world really. What is considered the normal failure rate is nothing short of scary and alarming. Very close to all startup companies are headed for failure before they can become anything, again, anywhere in the world. The odds are stacked against the entrepreneur so much, any break anyone can give them is welcome relief. Anywhere in the world. But more so here. If the local tech startup ecosystem is to improve, we need to support each other. Over last week, after reporting that Astro – a new local startup company in devices and exploring Software as a Service platforms – appeared to be lying about their products, some of the feedback we got from readers, was that it was wrong for us to mention this. That we are what’s wrong with the tech startup ecosystem as we are just pulling them down. That a startup has many struggles already without worrying about bloggers scrutinising them. The Astro founder himself, Munyaradzi Gwatidzo, went to the extent of showing us examples of glowing articles penned by other bloggers. Why can’t you be like them, being the message. We love startups. We talk about them everyday at the office. Astro happens to be one of the few we talk about more often in terms of how they see the future that their competition seem oblivious to. That they are bold in the steps they take and raise money for it. Astro are not trying to be the best device company, they are working to be a platform company. They have made attempts and are working on payments, on a music market and we think streaming as well. They see a broadband everywhere future where smart TVs will be in average income families, and they are positioning already for that future. They are working to disrupt DStv’s market dominance in the future. We respect such boldness and risk taking in a local startup. But then the lies come. Astro tells a room full of the media, ICT Ministry officials, Investors and key customers that they have invested in 8 months of R&D to come up with the world’s thinnest phone, which turns out to just be fables. The room applauds them; ministers, permanent secretaries, academics and the few investors that local startups are chasing, all marvel at the strides Zimbabwean innovators are making in spite of the odds. That the startup is making a fool out of everyone is a small issue of course. The bigger issue is where do they draw the line? What else are they lying about and who else are they lying to? And what precedent are they setting in the ecosystem? And if we all line up as a herd supporting blatant lying, really, what ecosystem are we even talking about? And when all this nonsense blows up in their face, like it has done before many times (even for Gwatidzo himself) how will this affect other entrepreneurs looking for support from the ecosystem. If local investors get burnt by these lies how does that affect other startups raising funds locally? The frustrating thing, and what we don’t get yet, is why Astro has to lie in the first place. Slapping a company’s logo on phones designed and produced in China is itself not wrong. It’s done all the time even by the mobile operators. It’s a brilliant model as Astro doesn’t need to invest in R&D yet in these early stages when they don’t have the money for it. They can build a strong brand on this without needing to lie. They don’t need to talk about how they design phones and how their innovative design is now the thinnest phone in the world. There are many creative ways to play with the marketing words without blatant lying and misleading the market. Lying doesn’t help technology entrepreneurship locally. It hurts it. Whats more hilarious is that Gvt is falling for the same tricks. They were shame faced after cheerleading Nhava which went on to rip-off a great number of people including the civil service whom they had encouraged to buy into it. If Technical people or platforms like Techzim do not scrutinize such things, what are they there for? To cheer lead false claims?!!!! How has focus shifted from overt lies to not supporting business? Shall we sit back and watch people misrepresent our profession? – and lastly, the happy liar who would have made their fill of money. Thank-goodness I dont write for TechZim, otherwise am as blunt as they come, would’ve stripped them down to their false-selves. Originality should be the innovation. Hope Mr Chanakira did’nt invest in a lot of money. its typical of us africans to pull each other down, astro and gtel are doing a great job,whats so speacial everyday apple sumsung huwei are always copying each other and all claim to have the slimest phopnes.live astro alone . For the record, i do not have a problem with Gtel, G-Tide or the other chinese phone companies in Zimbabwe. It’s the Astro lies that piss me off. Please look at that advert. my friend, business isnt your strongest suite i see, lies are lies, period. I have followed Techzim for 4 years now. Simply because they critically analise all their stories and bring them forward. Bravo to Techzim. Astro is hurting its own reputation by lying. Samsung and Apple play with words, they dont openly lie about their devices! You think you’re being supportive? You’re worse than our hatefulness to lying. Mana ng’ku tshele ke sis/bhuti silibaziso. Akwenziwa njalo. Esikwenzayo yikuqondisa umuntu. As’ngeke samjwayeza ukuthi eklabalale etshel’abantu ukuthi wakhi ndizamtshina ngotshane. You, my friend, are worse than our vile reactions. I’m also for empowerment, but not at the cost of our integrity. I refuse to believe that a Zimbabwean company has to straight up lie to be successful and that worse still, we have to accept it because they are local. If the 8 months of R&D were for software, they should have said so! No need to imply designing the phone from the ground up. If it is the slimmest device they have ever specced out and brought to market, they should say so! Claiming it’s the worlds thinnest phone without verifying such a simple fact just tarnishes the company and the local tech industry. They should be a success for what they are instead of a facade of half truths and lies. Lets hold each other up to a higher standard, truth is not useless. Yeah yeah…and you’re just one of them. Empty vessel. Innovative at lying. Ana Mukuru263 what have you done that people can talk about mungoda varungu venyu chete, endai ku britain ka. musatinyangadzire vanhu vane zvavarikuita. kunyora pepa hazvirevi kushoropodza nguva dzose. Unotoshaya kuti zvinombo fambasei. I dont see astro knocking on your door step forcing you to buy. Vasiyei vakadaro. Itai zvenyu tione. Nyika yedu haibudiriri ne attitude yakadai. I agree With Mr Editor.They must just say they are a distributer of products untill they raise enough cash from the products they are distributing to actually Hire Physicists and engineers to design and make their own products. Nike Started out that way. Nike founder was importing sneakers from Japan and selling them from his car untill he generated enough cash to start developing his own Sneaker Range. There is nothing to be ashamed about if one starts out this way but please dont mislead the public. Sorry to burst your bubble but,except for people like you who have an association with them,no one likes people who make false proclamations and mislead leaders and consumers.Its shady,unprofessional and a bit foolish to proclaim that you designed the thinnest phone and to actually dare to insult people by saying its “locally produced”.Who do you think you’re kidding? We won’t let you get away with misleading people and its good to set the record straight that no one in the tech community (except your people) endorses your untrue statements. I suggest you read on the Nhava liars. Your kin. Bla Bla Bla Bla tech who basa kungochinja mazita. Lies are not necessary guys. We will support them even without lying. This should be their 2nd year so we can’t expect them to be competing against your Samsungs, Apples, ZTEs or even Huawei. On another note they provided Powertel with the wifi models and the dongles. It is sad to say that I had to have two wifi modem replaced within about 4 months and finally had to go for the dongle. So in as much as you need support tell the truth. Why are you against ZIMASSET? We do not expect such malicious accusations .By the power invested in me i will make sure that i have this page removed IF THIS CONTINUES kikikikikik. i support astro 100%, i bought their new phone, the virtual II, it is great! but i do not support the lies. Mr Gwatidzo, please don’t lie to us, We will still buy your product because i believe in the vision you have for yourself and this great nation Zimbabwe, but the lies NO! I applaud TechZim for not joining the bandwagon of lies. Kutotiwo takaita R& D kikikiki, dai vangoti takaita market research. Pamwe kusaziva. Am not a Christian but “He who hath not sin shall cast the first stone” lol…. Always expose liars. And I’m not being sarcastic here. Astro is doing a good job . Its producing a good quality phone that can compete with the best .But this does not give them the right to lie. I am one of the guys who support the local industry by actually buying their products. After the atrocious customer care service from Gtel after my A706 developed faults I am actually considering the Astro route. From the spec sheet this phone exceeds the Gtel A717 by far. Also a comparison with the V2 specs shows its a advanced copy of the V2. They did not need to lie. TechZim is correct to expose them. The lies will only detract people from an otherwise good product. They have been only a short time in the business and they are doing a fantastic job. I dont expect them to compete with the likes of Samsung and Apple in such a short time. if you have ever been short -changed you will never support people who lie. I need to buy knowing what I am buying. i ain hatin, but astro is not a local product – period. This article reminds me of what Strive Masiyiwa said in one of his facebook posts when he mentioned that in business you must never compromise your INTEGRITY. Though I think Kabweza could have expressed his point in much fewer words, his role in IT locally plus his Facebook/ Twitter following warrants that he speak out on Astro’s falsehoods despite how uneasy it may be ! Seriously, you’re OK with ASTRO claiming they developed the device? Rather than sent a chinese company their logo and wait a few months for the stock to arrive. As Limbikani states there is nothing wrong with coming up with a brand and being proud of it, just don’t con people by saying you built it when you didn’t. The issue here is LYING. Is it emotions, or does the zim tech community not understand english? Haha, ASTRO stop saying you developed the phone and just stick to the marketing of your branded device. 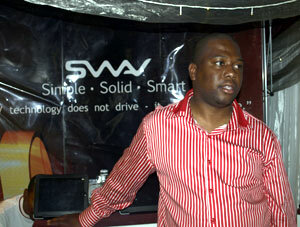 Limbikani, keep up the great work at Techzim we want real tech news not people trying to boost their own ego’s. And you sell it for $499 thats around 190% gross profit. Obviously after taking into account over in an extreme case it means your profit will be 100% conservatively. That god business sense. i applaude Astro for that. But making claimings which can easly be discredited by a simple google image search that unethical. What is worrisome is the mistake is more of stupid and you still want to stick to your guns? maybe u want us to get some callipers to truly measure the thickness? Astro should be taken to task for the lies. Imagine what our investors think? That we come up with ideas, get R&D funding but go backdoor to purchase the goods for rebranding and resale??? What is A Visual Defence Analytical Mindstream? I agree with Anonymous that they are just a distributor that has managed volumes that enable them to put their logo on the merchandize. Much like the blank CDs and DVDs that many of us buy from Fainoos. Has Fainoos ever claimed to have set up a LOCAL manufacturing plant for blank disks? How can anyone seriously defend such uncouth business practices? We cannot grow as a nation if we defend such bad practices. Some want to compare this with Dairiboad producing Chimombe in South Africa but if you look at that case then you will see what integrity is. They have OPENLY stated that they prefer to make Chimombe locally but it is currently cheaper to have it toll manufactured in SA than to produce it locally by up to 20c per box. It is also CLEARLY written on the milk box that the milk is toll manufactured in SA so if you are a consumer who reads the packaging, you know what exactly it is that you are buying. The Astro Team needs to come out and tell the truth. They need to show that they are not pulling off a con like the NHAVA people that misled consumers and government. If their work was stolen they need to prove it to us otherwise they currently look like shameless liars. INTEGRITY IS KEY IN BUSINESS.